He’s only one morning into his new role as Good Morning Britain co-host and Piers Morgan has already marked his debut with an awkward interview. 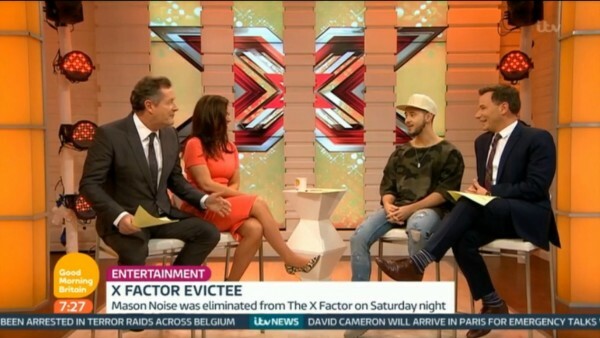 Sitting with Susanna Reid and Richard Arnold, he antagonised X Factor contestant Mason Noise as he pressed him to reveal his real name in the awkward encounter. But Mason’s reply: “No, it’s like asking Batman what his name is,” evidently riled Piers, who questioned whether the aspiring singer had his ego in check. “Like asking Batman what his name is! Mason, is this the problem? I was watching you, I loved you sticking it to Simon obviously, but when you liken yourself to Batman, a superhero saving the world, do you think the ego is writing cheques that the body maybe isn’t quite able to cash?” he asked. And their aggro continued on Twitter. @piersmorgan Glad I’ve finally met someone with a matching ego (batman voice). As Morgan noted with glee after his first stint finished, his name was trending all morning. His appearance, however, was met with mixed reaction on the social media site. Loving @gmb this morning ! @piersmorgan is hilarious ! Well done @itv great addition to the team! Why is Piers Morgan on breakfast TV he shouldn’t be on TV full stop ! There was another awkward moment for Piers when the former newspaper editor’s famous friends were called on to welcome him into his new role. But Piers took the opportunity to question whether her new role as his on-screen wife got him any, er, “TV conjugal rights”. “No,” said Susanna, quickly shooting him down before she awkwardly leaned away as Piers went in for an embrace. It was followed by Lord Sugar teasing that he now understood what morning sickness felt like from seeing Piers’ face on the breakfast show, while Ant and Dec sent a message from the Australian jungle. After the show, Lord Sugar helped keep the Twitter traffic up.